I have over 100 hooks packed and ready for Matangwe. Many thanks to the Ontario Rug Hookers who passed on their hooks for the cause. Donations came from Toronto, Campbellford, Cobourg, Bloomfield, Kingston, Lansdowne and spots in between. And I’d like to say particular thanks to Karen Kaiser who donated several yards of good quality burlap from her shop and to Mary Anne Keast who donated her supply of nylons for me to dye and to the countless others who dragged burlap and t-shirts to meetings so that I would be well supplied. I hope we are going to hook some brilliant plants and birds. I’ve also been lucky to work with Mrs. Melanie Lee and her grade 6 class at Park Dale School in Belleville. These wonderful students have made a video about their school as well as written personal letters and woven bracelets for each of the students in the grade 8 class at Matangwe. Park Dale has donated pencils, erasers and sharpeners so that each of the 500 students in Matangwe Primary School will get new supplies. And if all goes well, the students will meet in person because we will be Face-timing from Belleville to Matangwe next week! That will be amazing. Park Dale has been partnered with Matangwe for the past two years, but this is the first time we will get to talk to each other. And finally I would like to say a big thank you to my family and friends who together are supporting four students in the Matangwe area through high school and one lovely young woman through university. You are making more of a difference than you know. A few years ago I took my first ‘group’ painting trip–to the south of France. While I really enjoyed the countryside and the people I was with (particularly my great roommate with whom I still correspond and who by the way is a great painter), I was clear from the beginning that I wanted to sketch in a sketch book and not work on big sheets of watercolour paper in the hopes of creating a work of art. I am a sketcher, not a painter. For me sketching is about capturing the moment, a way of recording where you were and how you were feeling about it, how it struck you. Inspired by some of the sketchers I love, I sketched my cappuccinos and my meals. This was a source of amazement and even annoyance for the teacher. But I persevered–and I am still at it. 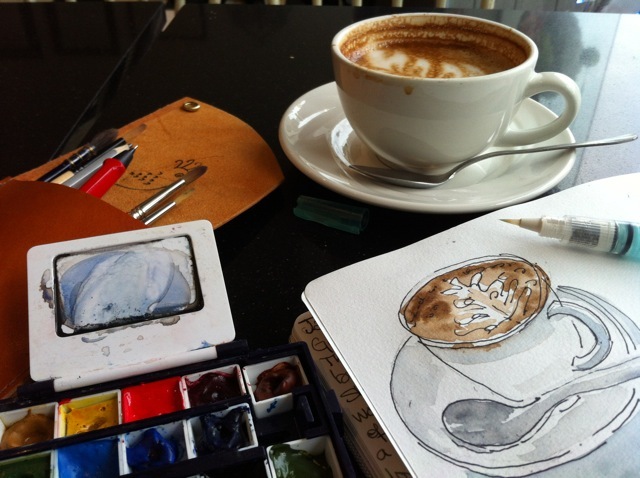 I love to sit in a café and paint the table and the surroundings and the people. I am working on producing sketches that are looser and bolder and more fun. That capture the essence even with a line or two. Imagine my delight when I found a new sketcher today who does all these things in a post with Liz Steele, one of my favourites. 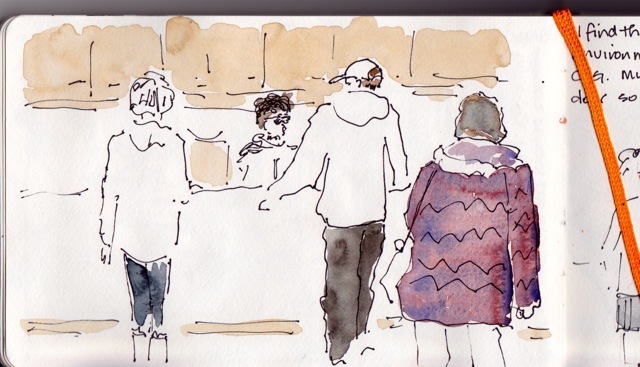 I don’t think anyone has sketched more cups and cafés than Liz. And for inspiration, before a sketching trip, I always watch this delightful video. He makes it look so easy. The duffle bags are out of the closet and the piles of clothes, supplies and equipment are on the bed. That’s as far as I am right now. Hoping all I have to take will fit in. I have splurged this year and bought a duffle on wheels from MEC so that it will be easier to move all this stuff around. The wheeled version will have my personal travel stuff, my clothes for Kenya (most of which I plan to leave there), my clothes for Amsterdam (warm stuff, especially for outdoor sketching), my food (power bars mostly and granola) and my art supplies. 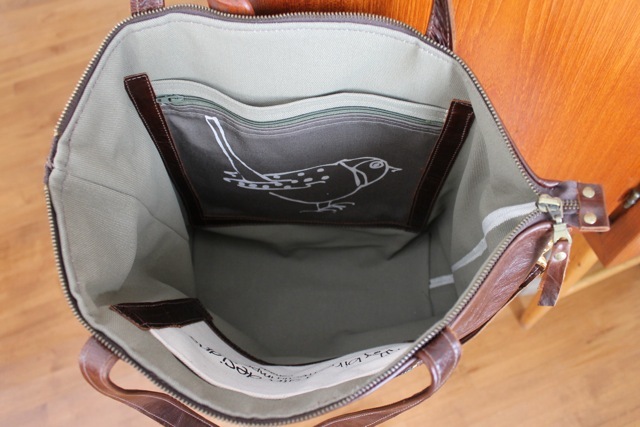 The second duffle will have the hooking and school supplies. I can take two 50 pound bags to Nairobi, but there I have to shed one and send it by bus. This is always a moment of panic for me as I see all the donated hooking and school supplies being hurtled away, but each year the bag miraculously appears the next day in Matangwe on the bus. So fingers crossed for this year again. 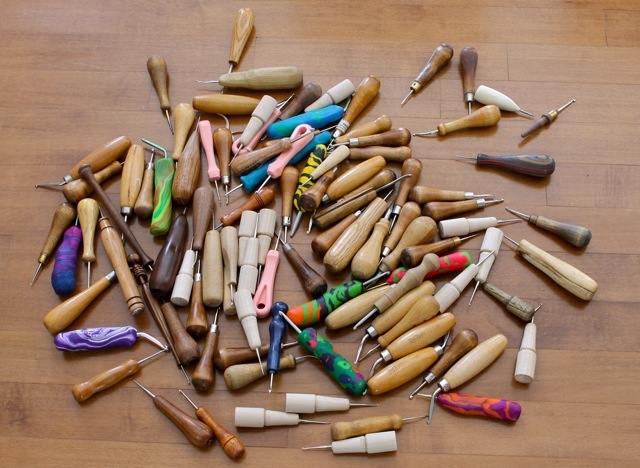 I have been making decisions about my sketching kit. For the first time, I’ve decided to use a large sketchbook which will encourage me to take a looser approach and fill a page with related sketches, making a kind of narrative. Above is the opening page. 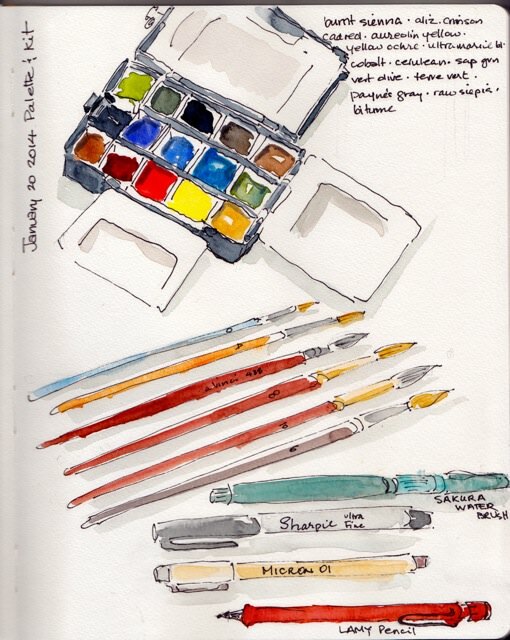 Following the example of some urban sketchers I admire (here and here), I’ve sketched much of what will be in my kit. This small palette forces me to limit the paints I take. These are my favourites, especially terre vert, payne’s gray and sepia from Sennelier. I think it is as much the memory of the snooty place on the Seine as it is the depth and richness of these colours. 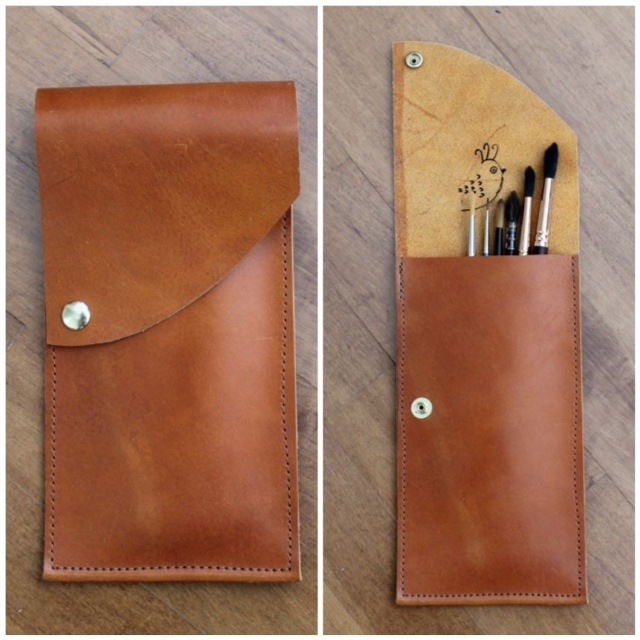 I have made myself a leather case to hold my brushes. I’m pretty happy with it because it protects the brushes and fits neatly in with my gear. In addition I’ll have a small pencil case, the palette box and a water bottle. I’m trying to keep it simple, so that I’ll have the kit with me all the time. Of course I’d love to have my stool and back board–but not this trip. Anyway, a good excuse for shaky lopsided sketches! 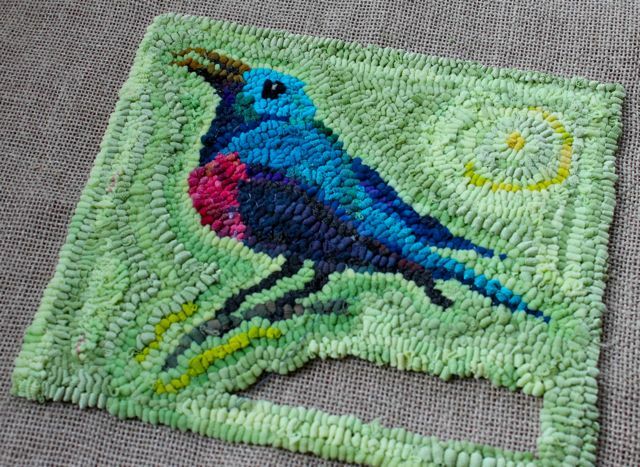 It is just a week until I leave for Kenya and the sunbird trivet is close to done. This will be an example of the kind of hooking we can achieve. I wanted to know how many pairs of nylons were needed for the background because I hope to make up kits for starting out. We can feature some of the amazing birds and plants of the area. This is just a small trivet, 10″ x 8.5″, and I have used two pairs of hose for the background, every part, top, waistband and legs. 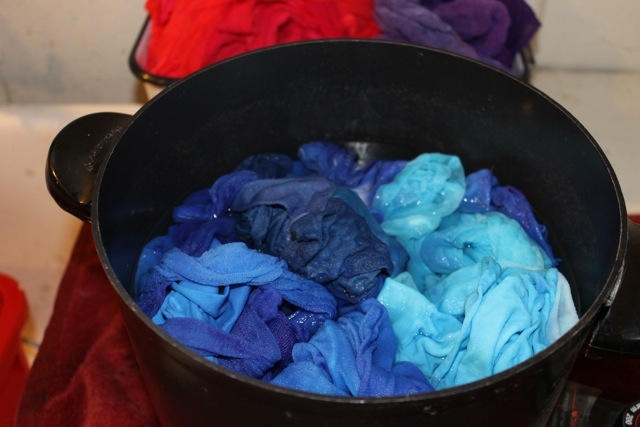 There are several advantages of hooking with nylons: the vibrant colours, the light weight for packing and travel and the washability of the final product. The on-line shop will be closing on January 20th until the end of February. 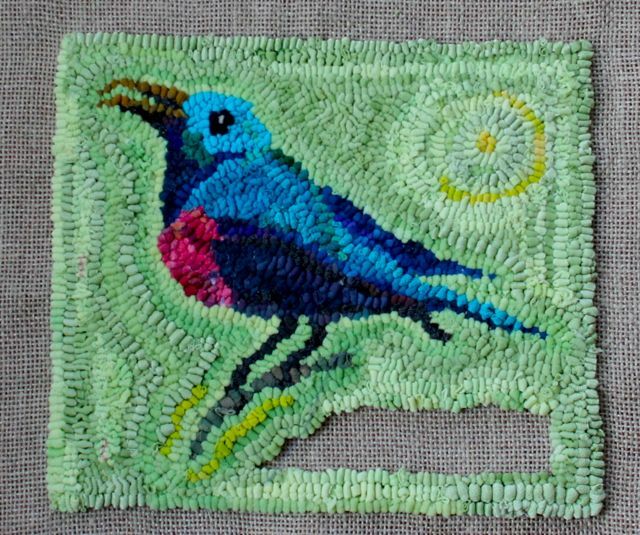 As most of you know, on January 23rd I am returning to teach school and rug hooking in Kenya for a month, followed by a few days of sketching in Amsterdam. I plan to continue blogging and I hope you will follow my travels. In the meantime, there is a sale in the shop beginning at noon today, EST. Just click here or on the on-line store button on the right, under Navigation, to see what is available. 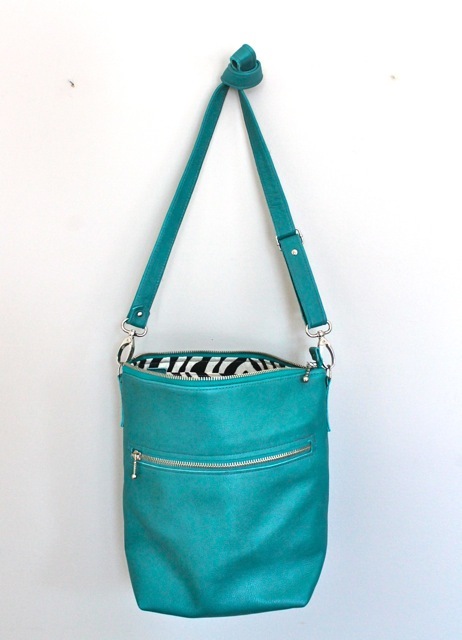 I had just enough of this lovely turquoise leather to make a final Keller bag. The last one went to Chicago and I was very pleased to read this comment about it. I have been running the online store for 10 months now and I have learned lots and met some super people. I will be closing it for a month beginning January 21 because, as you know, I will be in Kenya. There are a few things in it now and I will be adding more for Monday when I will be having the first online sale. I hope you will check it out Monday afternoon for some great bargains. This Keller will be available on Monday too. I went to my hooking group this morning. What a treat on an icy morning to settle in with my hook, newly-dyed nylons and good conversation. These longtime friendships meeting over hooking frames are incredibly sustaining. A recent Globe and Mail article, explained the therapeutic advantages of knitting which I am sure are equally relevant for rug hooking. After quoting Kaffe Fassett about the ‘life-enhancing’ advantages of playing with wool and colour, the article cites the work of a doctoral student at the University of Exeter who says: “I have seen how knitting helps people with stress problems, post-traumatic stress disorder and pain. But it’s not just for people with problems. It’s a great, portable preventative tool.” No one in our group is conducting research, but at the same time, no one doubts the positive effects of a morning with colour, design and good friends. 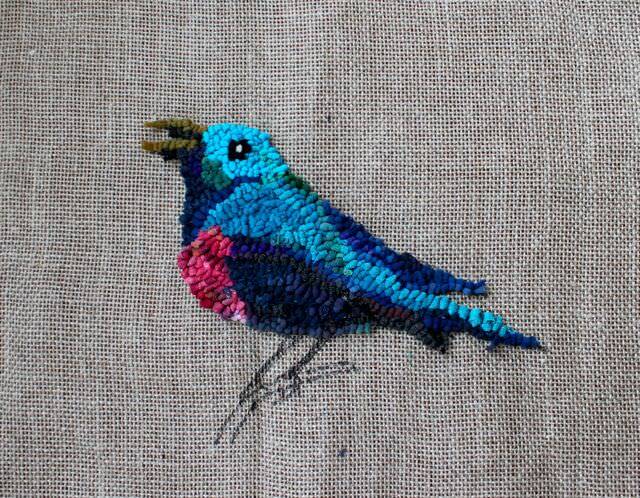 As for the sunbird–I’ve made some adjustments to his beak and started the background. I hope to have it finished and another one started before I leave. Stay tuned. All night long there was freezing rain and ice covered everything this morning, again. 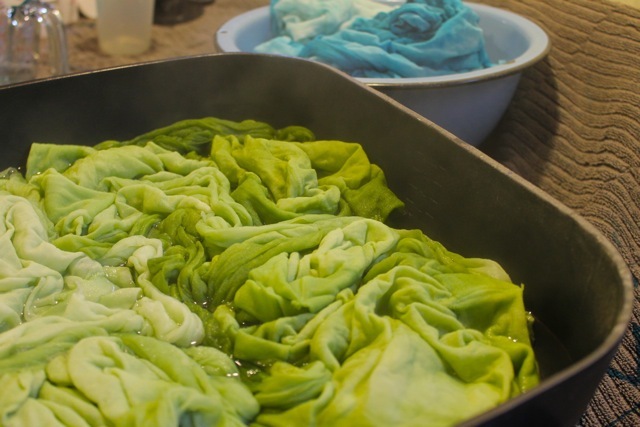 It seemed a perfect time to head to the dye pots. Colour and steam can do wonders to improve one’s outlook. As I mixed the colours and watched the magic happen (nylons are so unpredictable in the way they absorb colour–all the colours in the second pot came from 1/8 tsp Aljo Royal Blue) visions of the Kenyan landscape filled my mind. I was aiming for the colours of the birds and plants as well as the grasslands and sky. 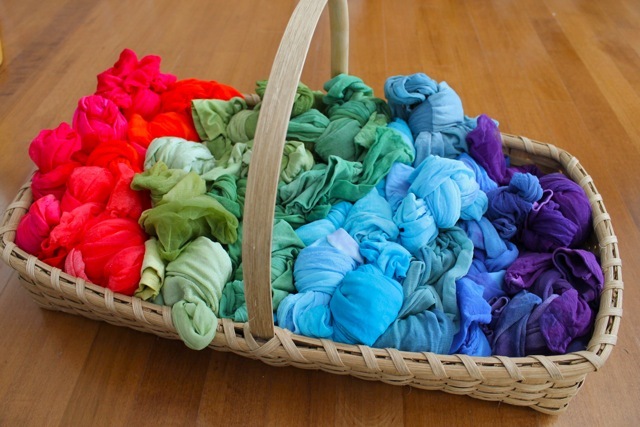 By the time I was finished I had dyed 60+ pairs in the brightest hues. 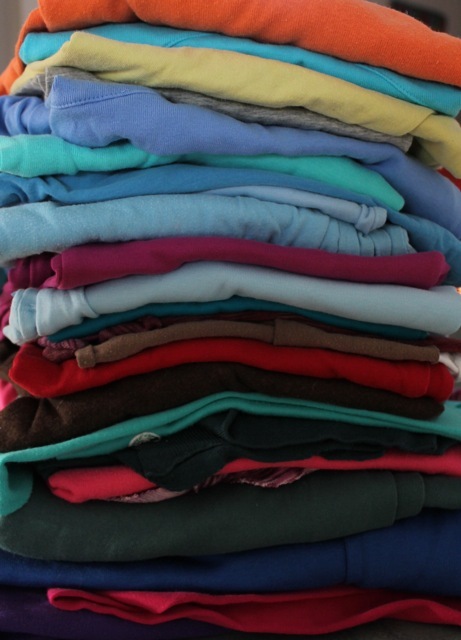 Below are some of the t-shirts which have been donated. I’m not sure if we will be able to combine the cotton and nylon or not. But either way, we will have the beginning materials for the next stage in the Kenyan rug hooking story. Of course, I can never bring enough, so I want to find a source of used material which can form the backbone of the hooking once I leave. I’ll keep you posted. 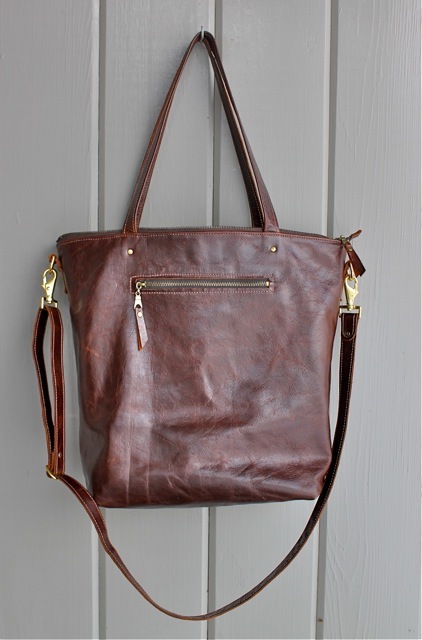 This is the last bag of 2013, a rugged, durable tote which can easily accommodate your laptop and all other essentials. 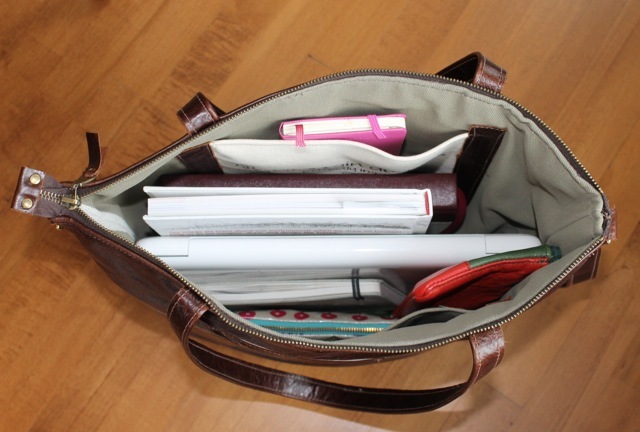 It is also big enough to serve as a great overnight bag–or, as I have seen with one of my totes, a very serviceable diaper bag! 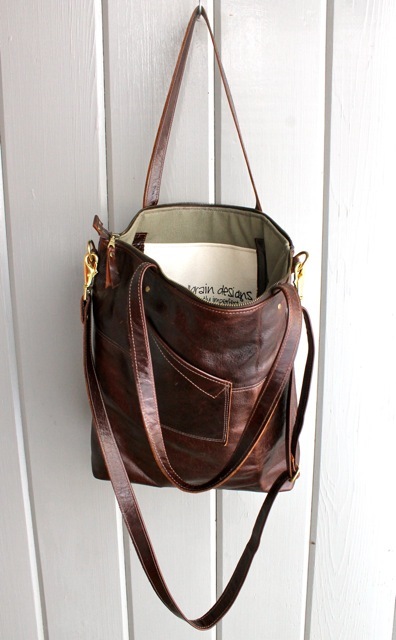 It is made from a remnant piece of upholstery leather with a double leather base. And although it is new leather, it has some character marks where it was folded and creased. 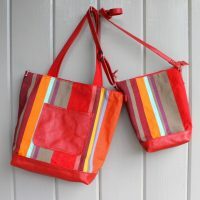 It has two carry options: an adjustable shoulder strap which can be removed as well as a set of handles. 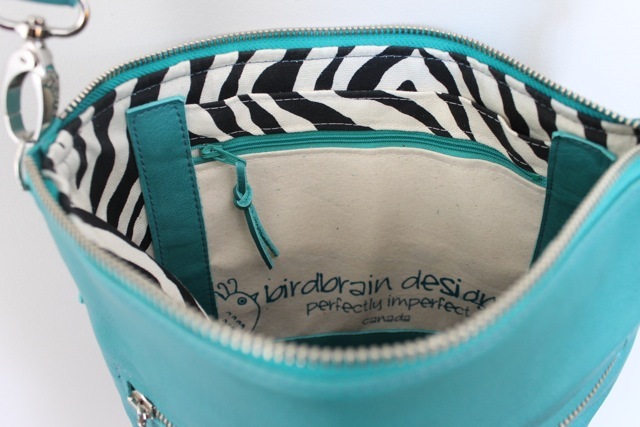 On the front is a large zipper pocket and on the back a funky phone pocket. 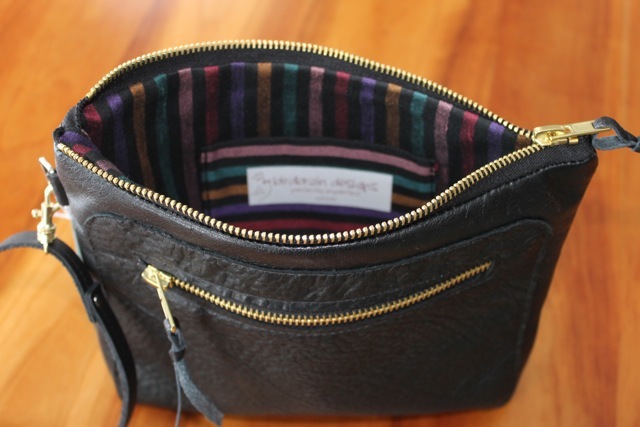 Inside it has a taupe canvas lining with three pockets and lots of room. Overall size: 17″wide, 15″ tall and 5″ deep. I sit in the bay window at the back of the house, morning light over my shoulder, enjoying the antics of the juncos and blue jays at the feeders — and — hooking a Kenyan sunbird. My mind jumps to Louis MacNiece and the poem I first encountered in high school. The world soundlessly collateral and incompatible…crazier and more of it than we think, incorrigibly plural. At 18 I had only the slightest notion of the pluralities, the incompatibilities and incorrigibilities to come. I contrast the world of my small Ontario city with its birds pecking in the snow and the world of Matangwe Kenya with its glories and its desperate needs. I will be there again very soon, planning to hook again with the local men and women, to create some beauty and hopefully move a little closer to a sustainable enterprise. 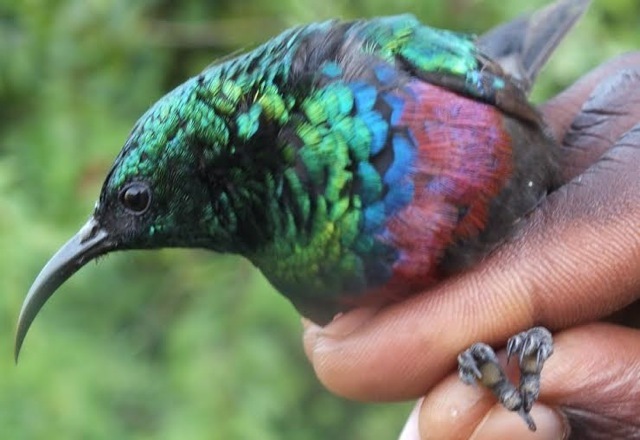 I am hoping that this year we will hook some of the beautiful flowers and birds around Matangwe. 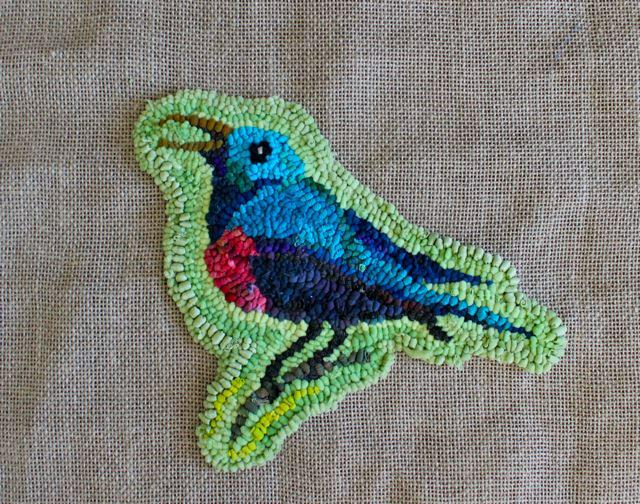 I decided to begin with a sunbird using some dyed nylon hose I had. I was trying to capture the magical incandescent colours. Last year we worked with t-shirts, and of course, my goal is that all the materials we use will eventually be sourced locally. And yes, I will pack t shirts and hose into my duffle bags this year. But we will also scour the local markets to see just what is available to hook with and see what beauties we can create with local goods. I am inspired by the hooking being done in Guatemala. Below is one these rugs which was on display at the Textile Museum in Toronto last spring and here is a link to Jen Manuell’s work there.